Manila, 10 April 2019 — If you think that giving respect to either senior or emerging leaders is hard, then this post is for you. In the past weeks as I was traveling, young professionals and emerging leaders in Asia told me about their challenges to engage with executive leaders in an effective way. Most seniors, they thought, demand too much respect and often for the wrong reasons, like their length of experience and the positions they hold in the hierarchy, rather than their actual achievements and experiences to bring about positive changes. Moreover, many seniors were seen by the emerging Millennial leaders to be taking them for granted and finding it hard to acknowledge them for their contributions and to respond to their eagerness to learn with mentoring and coaching styles. Listening to their concerns prompted me to reflect on this issue of the demanding and giving of respect, recognizing how important respect is in building inter-generational leadership and collaboration. Are you with me so far? Then let’s double click on this respect issue and see if we can take some perspectives that help us understand and improve the situation in and outside work. I believe we need to start with a fundamental point. When we observe (and sometimes complain) that communication patterns in life and work are not the way we want them to be, we either accept that reality, or we recognize that we have a choice to change things for the better. These two mindsets are shown in the diagram below, a bit provocatively, as living as a Zombie or a Leader. The key point in that distinction is that when we become aware of what is really going on—for example by double-clicking on the issue of respect and taking more perspectives on it—we also discover that we have a choice to make a change in ourselves and with others. The term Zombies is used for people who are not yet showing themselves to be really alive and making choices and changes for themselves. Leaders, on the other hand, are nowadays described as people who have decided to learn to lead themselves and others and influence processes of positive change around them. The cycle that Zombies find themselves in is shown as a clockwise movement from unawareness to engaging in routines that produce results, and to keep recycling in that pattern without making significant changes. Zombies are therefore ending up with getting the same results over and over. Leaders, on the other hand, practice to increase their awareness and that helps them to recognize choices they can make to influence positive changes. I have shown this cycle in a counter-clockwise direction, because it goes against the flow of normal patterns, habits, and routines. It involves creativity and making a change. This distinction of Zombie vs. Leader is not so different from what gurus from the wisdom traditions around the world have been telling their audiences for the past thousands of years. Take, for example, the Buddhist teaching on the Cycle of Dependent Origination (or Paticca-samuppada in Pali language). This tells us that, in any situation, we can chose to change our behavior as long as we have sufficient awareness of having that choice in that moment. In Christianity, the original meaning of the word sin is to not hit your target, to miss out on something that is really important in life. Unawareness, the condition of not being aware of possibilities and choices, lies at the heart of that also. In the diagram below, I’ve elaborated on this contrast between the Zombie and Leader mindsets. Grasping and internalizing these two mindsets will help us step firmly into our Leader space. In summary, we can say that Zombies are driven by habit, and Leaders are driven by purpose. Are you with me on that? No wonder that we have a serious issue around respect, because most Millennial leaders are driven by a need for purpose in their life and work. Whereas most senior Boomers and Generation Xers have grown up with different values. 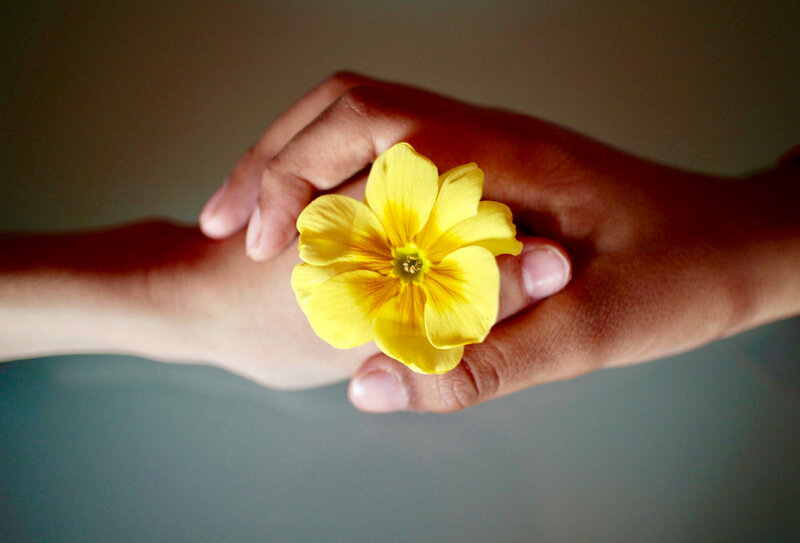 Now that we’re all in the Leader space, let’s see how we can exercise our awareness of the issue of giving and receiving respect, by taking several perspectives. I call this The Colors of Respect, and I have shown it graphically below. Each of the seven colors represents a certain way of looking at the world around you, in other words, a worldview. You can discover more about what each of the seven colors means in the Work In All Colors course. We all have a preferred way of looking out at the world, and to cope with the conditions of our life where we are. Most people are not aware of their own worldview, and tend to assume that other people look at the world in the same way they do. That is often not the case, and that’s when they are surprised to find so many differences of view and frictions between people. Take the example of senior leaders expecting to be respected for the duration of their tenure in the job, and the level of the position they hold. People for whom this is important are motivated by a worldview of order, hierarchy, rules and procedures. We use the color Blue to describe this worldview. It helps our world be organized, yet it comes at a cost. Giving respect, and the need to feel respected, can have many more reasons. Just look at the other colors in the diagram for a start, and the choices shown in the column on the left. All of these can be reasons for giving or expecting respect to another person. You can probably come up with some more reasons of your own. Beyond respecting a person for their position or length of service, we can respect them as leaders who uphold traditions in family and groups that are of interest to us. That can give us a sense of safety and belonging (Purple). We can respect other Leaders because they confront and inspire us quickly into rapid decisions and action (Red). They often leave us with little choice, we either go with them or find ourselves shut out from their support. Sounds familiar? And then, we can give respect to people who come up with great solutions that will make it possible to be more successful in delivering results (Orange). They make us go the extra mile to reach goals and targets. Of course, we can also decide (or remind ourselves) that every human being is worthy of respect as a person (Green). Why should we have a reason at all to give respect? Doesn’t every human being deserve our respect? That worldview helps us channel empathy and build solidarity and consensus. Yet another reason for giving respect would be for people with remarkable ideas and creativity to innovate (and often, disrupt) the way we work and produce goods or services (Yellow). We see such leadership manifesting prominently almost everywhere we go. And, at the top of the diagram, the Turquoise worldview provides a reason to respect people who give us new perspectives to look at ourselves, people around us, and the world we live in, and even about the planet we should care for together (Turquoise). When you explore these reasons for giving and receiving respect, you can also think of the positive changes that each of these worldviews makes possible. In the column on the right, I have shown keywords that help you double click on those possibilities for change. Having read this far, are you still with me to start exploring this variety of reasons for giving and receiving respect when you meet people, either more junior or more senior than you? Leaders are known for taking perspectives and making meaning of the situations we are in, the choices we have, and the changes we can influence, individually and collectively. 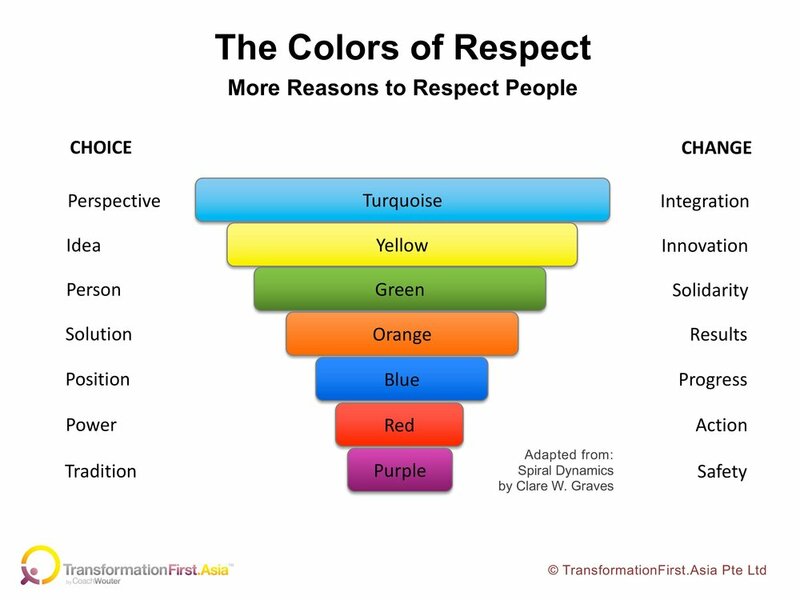 As you start unpacking the challenge of giving and receiving respect, which is essential for inter-generational leadership and collaboration, I encourage you to experiment with these seven Colors of Respect.